Deborah, an active member of the Chamber who is coincidentally the initial creator of its radio show, was named a Top 100 Small Business Champion 2012 by SmallBizTrends.com! She is the Author of Career Transition-make the shift, a media host, a small business branding/media strategist, featured writer and speaker. She hosts a weekly blog and a small business radio show with over 96K page views and downloads. Her articles are featured on SmallBizTrends.com, Careerealism.com, Forbes.com, PersonalBrandingBlog.com, MonsterWorking.com and Blogher.com. Deborah delivers smart, tactical ideas and solutions, which make her a go-to resource for media including CNN, Fox, CBS and HLN. 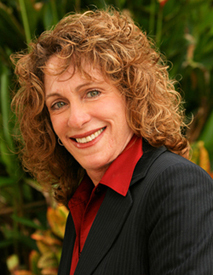 Connect with her on Twitter @DeborahShane, at DeborahShane.com or DeborahShaneToolBox.com. 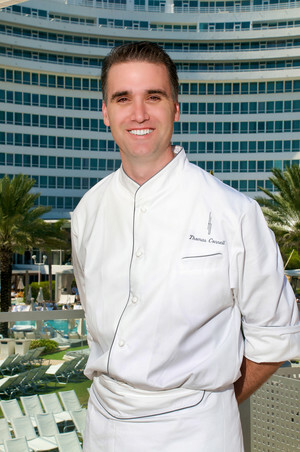 “Life is a stage- live your part,” says seasoned Fontainebleau Miami Beach Executive Chef Mr. Thomas Connell, our guest on August 31st on the Miami Beach Chamber Radio Show. As top food dog of the notoriously extravagant venue, Chef Thomas is responsible for all operations including menu design, training and food production for all of the resort’s food and beverage outlets, as well as catering support for 150,000 square feet of meeting and event space! Picture mouthwatering meats from Gotham Steak a few mere steps from Liv, delectable pastas and Italian dishes at Scarpetta, or charcoal-grilled seabass from Hakkasan: now you have an idea of this man’s daily doings. Prior to his current role, Chef Thomas worked with the Ritz-Carlton for 19 years opening properties with the brand in Bali, Shangai, Tenerife, Palm Beach, Hong Kong and Singapore. He most recently served as the Executive Chef for the Ritz-Carlton South Beach in Miami. There he was responsible for a culinary staff of 60 employees and operated 7 restaurants and food outlets. Prior to South Beach, he served in Barcelona, Spain as the Executive Chef for the Ritz-Carlton, Hotel Arts. At the five-star hotel, he oversaw a large culinary staff and operated 7 restaurants and food outlets. While in Spain, Chef Connell also had the opportunity to learn from some of the country’s leading culinary masters including Sergi Arola, Julian Serraano and Ferran Adria. As Executive Sous Chef at Ritz-Carlton, Laguna Niguel in Dana Point, a five-star, five-diamond, 385-room resort, Chef Thomas worked with 7 restaurant and food outlets with a culinary staff of 90. Before joining Ritz-Carlton, he was a Sous Chef at the Hyatt Regency’s famed Brasserie Restaurant in Los Angeles. This well-traveled culinary aficionado trained at the Institute of Culinary Arts in Palm Desert, CA, and later received his Associates Degree in Culinary Arts from the Culinary Institute of America in Hyde Park, NY in 1990. During his studies, he interned and trained at the Beverly Hilton Hotel and later became a chef saucier at the Beekman Arms Inn in Reinbeck, NY. Visit Chef Thomas and the unmatched culinary creations of the gorgeous Fontainebleau Miami Beach at http://www.fontainebleau.com/ or on Facebook or Twitter! Fontainebleau proudly participates in the uber-popular Miami Spice, so make reservations today!